When the time comes where you must discuss the terms of how a certain situation is going to go with other parties involved, then that’s where you’ll need to draft the right agreement document. You also have to make sure to know how to create the one which is suited for the situation. For example, you look up Commercial Agreement Examples so you can create a document which states what both parties can and cannot do in regards to commercial matters. Another example is creating Management Agreements to discuss how management within a certain company must operate. 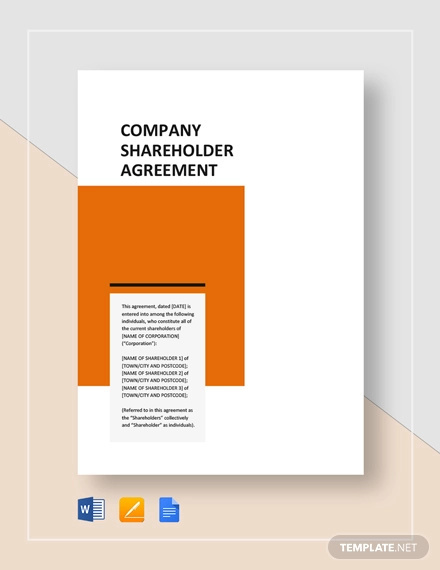 So in the event that you want to create a document which states the terms of how the shareholders of a particular company will run the business, then you’ll need to create a shareholders agreement. This article is going to teach you all that you need to know in order to properly make one. While you’re coming up with this particular legal document, you need to make sure that it’s tailored to what’s best for the company. Basically, it needs key provisions to ensure that everyone under it knows what their roles are and what has to be done in order for the business venture to be successful. 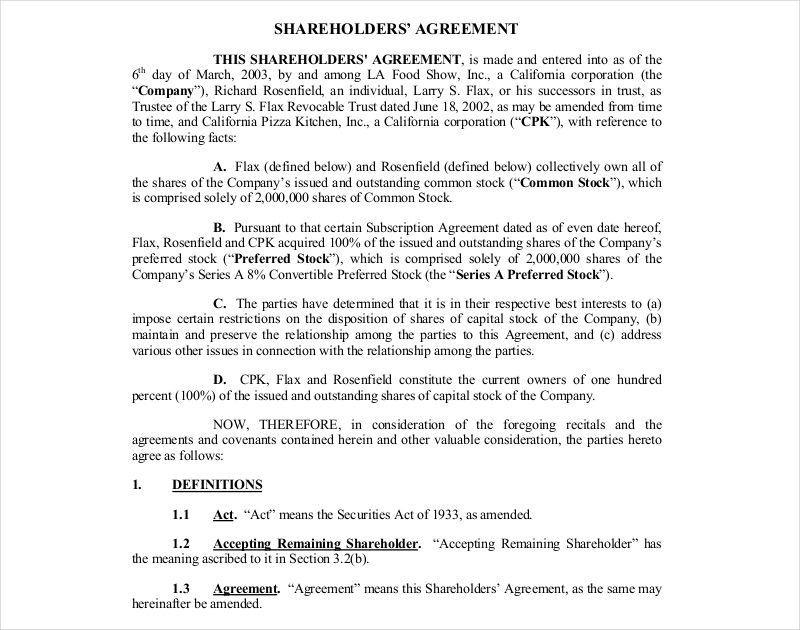 Similar to a Rental Agreement and Commission Agreement, a shareholder agreement will need to point out all of the parties that are involved, and that obviously the shareholders that will sign it and the corporation. 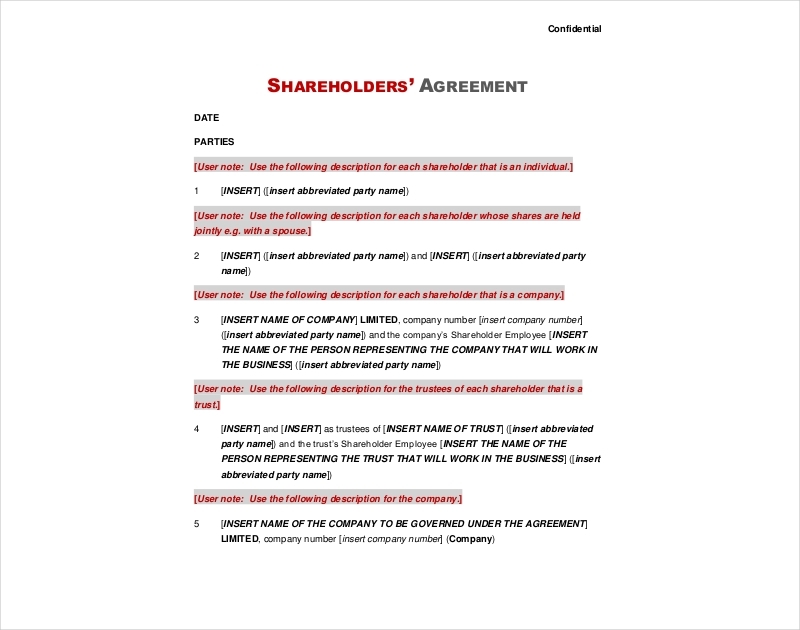 If you are a new company with few shareholders, consider drafting a unanimous shareholder agreement. 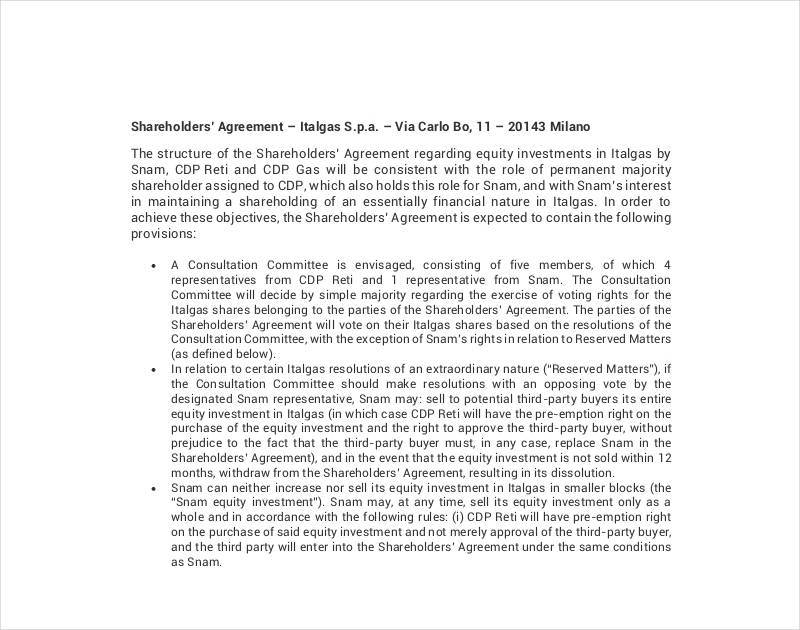 This way, you can guarantee that all of the shareholders become a party to the agreement. Even if it’s difficult to have every single one of them sign the contract, it’s best that you get them all to do it. If the main shareholders aren’t able to sign the document, then minority shareholders should enter into a separate agreement with the company that should outline all of the rights and obligations of the parties that are involved. The board of directors. 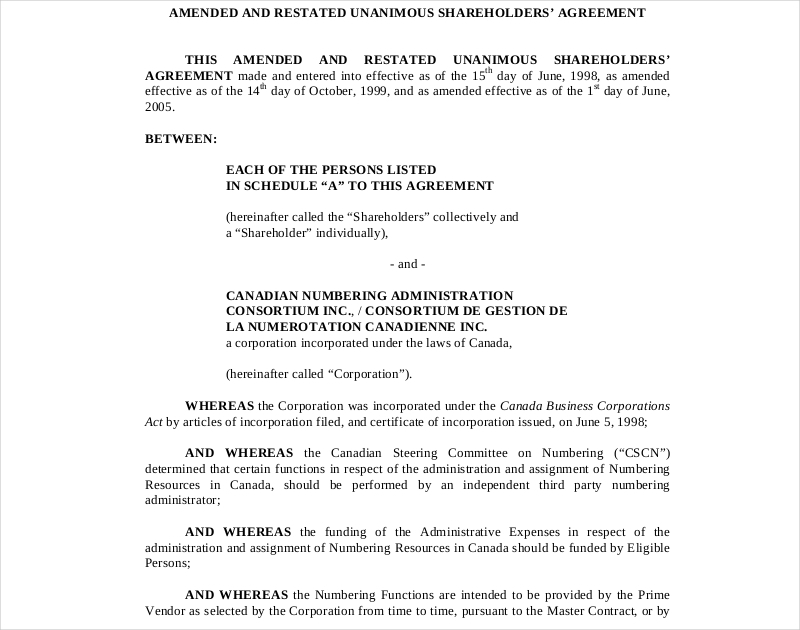 The shareholder agreement should be able to identify the number of directors, who the initial directors will be; how often the board will meet, how these board members are chosen, and whether the voting of these members will be decided on majority or through the percentage of the votes. You may also see agreement examples in PDF. The officers. The sample agreement should outline who the initial officers of the company will be and their title. You may also decide to include how these officers will be compensated for their services. How the board of directors will govern the company. Basically, this lists the duties of each board director and specifies who does what. The financial obligations (if any) of the shareholders. If shareholders have veto power over a board’s decision and how this is exercised. 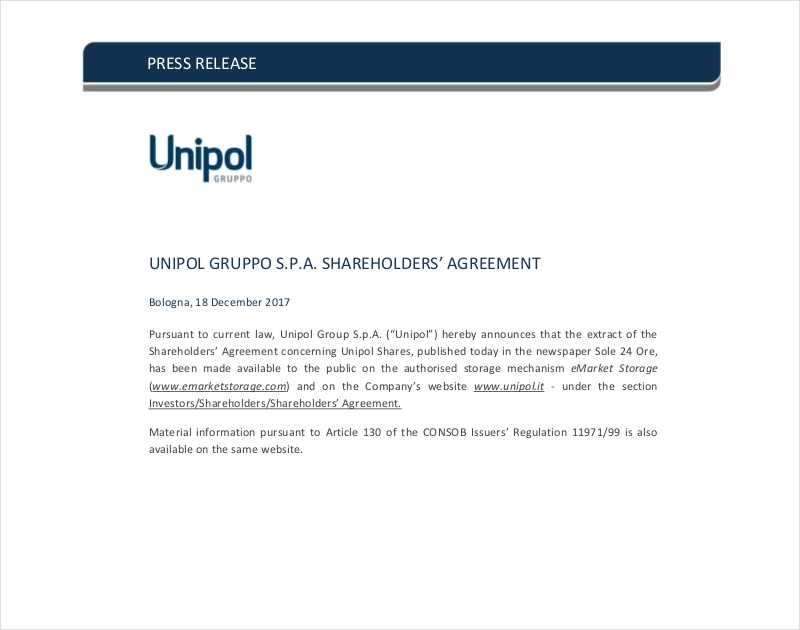 The release of the unaudited financial statements to the shareholders. 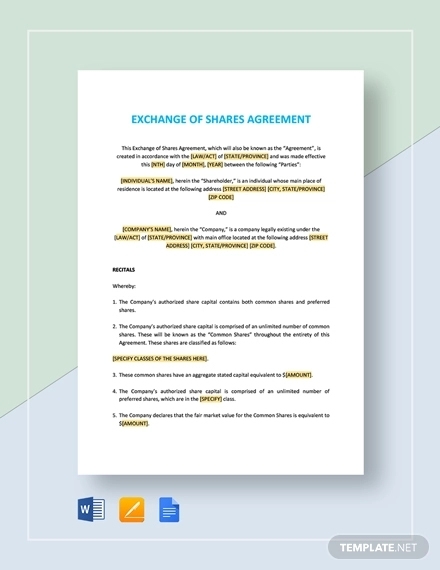 Generally, a shareholder agreement will contain a section which talks about the restriction on the transfer of shares, as well as the rights and obligations of each shareholders. That doesn’t mean that the shareholders aren’t able to transfer their shares, just that there are certain conditions that need to be met before it can happen. This provides some degree of flexibility for shareholders to dispose of shares or make tax-planning choices. You may also see transfer receipt examples. 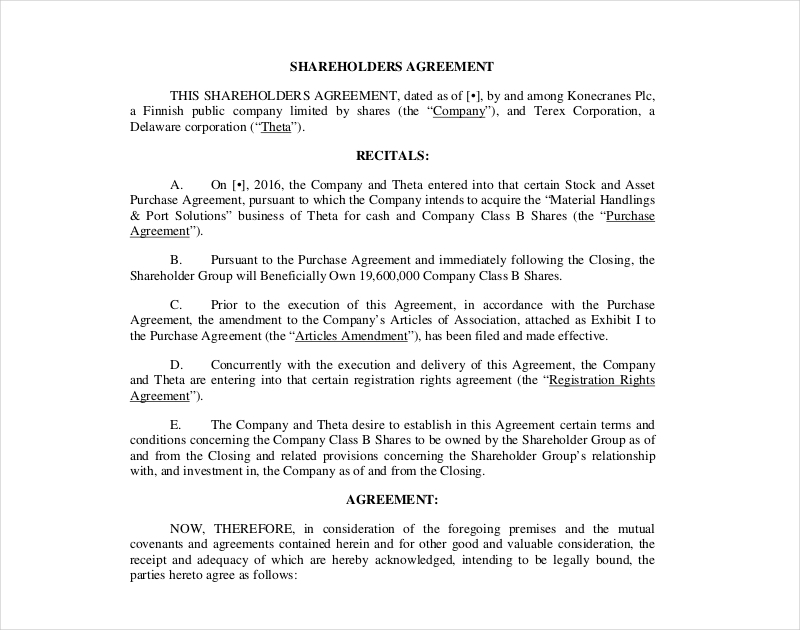 A shareholder agreement can include a provision that allows for the company to repurchase agreement the shares of a shareholder in the event that one happens to die or any situation where he or she is no longer able to be a shareholder of the business. This allows the shares to be maintained by the company and potentially offered and it can potentially be sold to the other shareholders. 7. Establish Co-Sale or Tag-Along Rights. A sample statement that limits the warranties and representations given by shareholders forced to sell. The minimum value of how much a stock should be sold in the event of a drag-along sale. The percentage of shares or the types of shareholders that will be considered as the drag-along sale. And just like a Consulting Agreement or any other kind of agreement you’ll need to have the signatures of all the people that will be involved in the document. Be sure that you have all of them or you may just encounter a couple of legal problems in the near future. 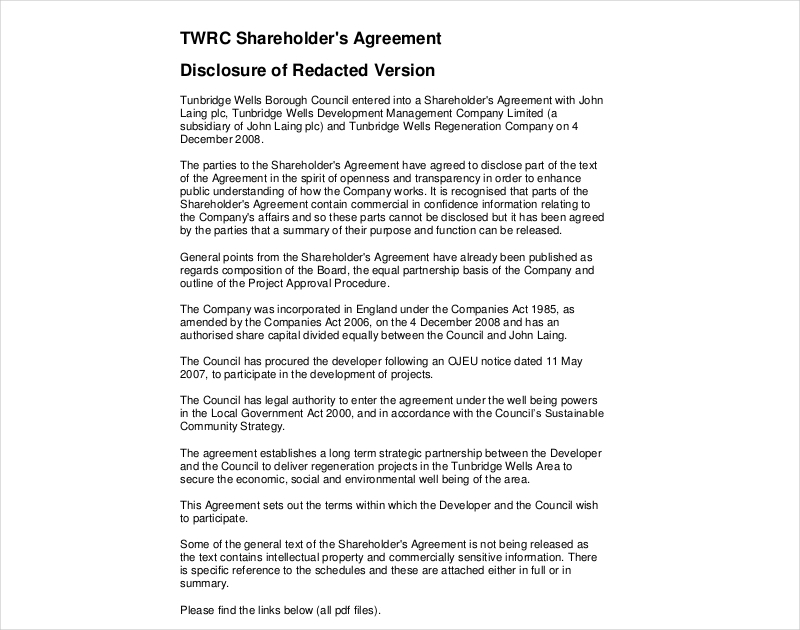 Also, remember that in the event that the major shareholders cannot sign the document, then you must look to the minority shareholders and come up with another agreement which they should sign. If you would like to learn how to make other types of agreements (Subscription Agreement , Confidentiality Agreement, etc. ), then all you have to do is go through our site until you’re able to find the articles that you need. Just be sure that you’re able to utilize what you’ve gathered well to help you out in your situation.